While I review all genres of books on this blog, one type that is near and dear to my heart is the cozy mystery genre. These mysteries are characterized by amateur sleuths (often librarians, bakers, retired women, etc) and they have little to no violence, sexual content, or profanity. The murders always take place off scene, and the setting is often idyllic (despite the fact that a murder has occurred). I think that one of the reasons I’m so drawn to these books is because I know they’ll have a happy ending. Life is hard and sometimes I just need a guaranteed happy ending in my life. I’ve mentioned some cozies here among my other reviews, but I thought I’d start having a regular, expected “Cozy Corner” segment. The first series I want to review is the White House Chef Series by Julie Hyzy. The first book in this series is State of the Onion. I love the pun-ny titles! (I think my favorite title is either Buffalo West Wing or Eggsecutive Orders). 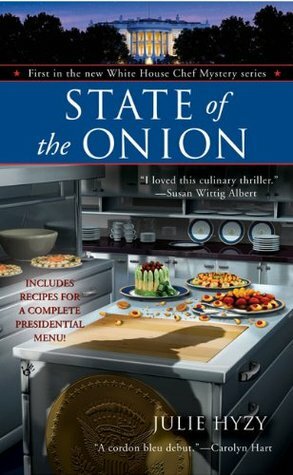 The series follows Olivia Paras, a chef in the White House who has an uncanny knack for stumbling upon murders. One highlight of the series is that it’s a bit more action-packed than other cozies. I liked the fast-pace and the fact that there were some moments where I genuinely worried about the character even though I was certain that everything would work out in the end – it is a cozy after all. Olivia is a great protagonist. She is career- minded and has to have some introspection as to whether or not she has time for romance in her life. She is a hard worker and is very competitive in the cooking arena, but she still has a soft side and cares deeply for her friends. This is not only a protagonist that you can root for, but she is also someone with a lot of potential for growth over the course of the series. While some characters in cozies (ahem – Stephanie Plum) never seem to grow as people, Olivia is one who seems to learn something about herself in every book. I think that cozy lovers will naturally love this series, but this one could also appeal to people who like action/adventure with their mysteries. The White House is also a really cool setting, and I feel like I learned some interesting details about how it is structured and some details about the traditional role of the First Lady. Overall, I’m happy to recommend this to anyone looking for a quick escape from reality!